SCOTUS’ travel ban ruling doesn’t make sense. That may be good for Trump. The Supreme Court’s ruling doesn’t make much sense as a matter of law. That may be good for Donald Trump. 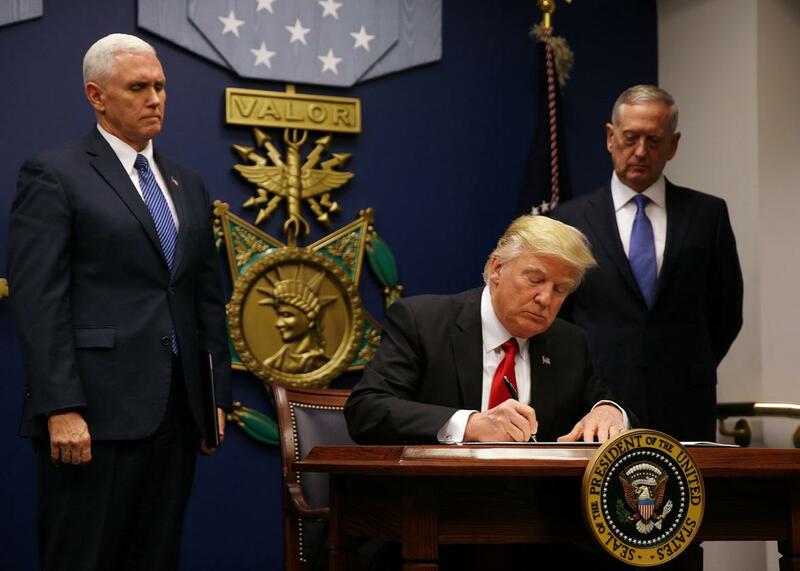 President Donald Trump signs his first travel ban executive order on Jan. 27. The Supreme Court’s ruling on Donald Trump’s travel ban is like an optical illusion: Your perception of it changes depending on your vantage point. To Trump and his allies, the decision looks like total vindication for the administration, a move that allows its long-delayed executive order to take effect. To left-leaning analysts, it’s a clever political compromise that still protects many of the refugees and foreign nationals who would’ve been excluded by the ban. There’s a reason for these wildly differing takes: The decision itself is confusing and ambiguous. That’s because the court ruled only on the injunction and thus dodged the central issue: the legality of the order and the president’s authority to pass it. The court’s baby-splitting shields the president and his opponents from an outright loss or a clear-cut victory. But it doesn’t make much sense as a matter of law. It preserves the authority of the Supreme Court to say what the law is—even though, by its own terms, it fails to say what the law is. To review: In March, Trump issued a second travel ban that was reverse-engineered to pass muster in the aftermath of the 9th U.S. Circuit Court of Appeals decision blocking his first travel ban. The second executive order temporarily prevented citizens of six Muslim-majority countries from entering the United States, froze the refugee resettlement program, and reduced the number of refugees allowed into the country this year from 110,000 to 50,000. Two federal district courts blocked the key provisions of the ban; both injunctions were affirmed by federal appeals courts. The 4th U.S. Circuit Court of Appeals found that the order unconstitutionally discriminated against Muslims; the 9th Circuit found that it exceeded the president’s statutory authority. Who, exactly, fits into this new category? Namely, people like the precise plaintiffs who filed suit against the ban. “For individuals, a close familial relationship is required,” the court noted. “A foreign national who wishes to enter the United States to live with or visit a family member … clearly has such a relationship.” So do “students from the designated countries who have been admitted to the University of Hawaii.” And so would “a worker who accepted an offer of employment from an American company or a lecturer invited to address an American audience.” By contrast, “someone who enters into a relationship simply to avoid” the order should not be excluded from it. And that’s pretty much all the guidance the court gives us. As Leah Litman notes at Take Care, the vagueness of these new standards is troubling, as it allows the Trump administration to interpret the court’s guidelines as narrowly as possible. It’s easy to imagine borderline cases: What about a Syrian citizen who applied for a job in the U.S. but hasn’t yet heard back? Or a student who sought a spot at a U.S. university but hasn’t yet been accepted? What about a Sudanese citizen who wants to live with her American aunt? Or her cousin? What about her stepcousin? The order’s opacity about what constitutes a connection may allow federal agencies to resolve such close cases against the individual. At the very least, it will unleash more uncertainty for a lot of travelers who are trying to get to the United States. The only thing that’s clear about Monday’s travel ban order, then, is that there is nothing clear about it. This ruling injects massive ambiguity into both agencies and courts that will now be tasked with trying to figure out what it means to be a foreign national who has “a credible claim of a bona fide relationship with a person or entity in the United States.” It also becomes one of those unfortunate push-me-pull-you results that allows the president to crow that he has scored a unanimous win, and that has professor Marty Lederman at Just Security persuaded that the entire litigation is basically moot. Lederman has argued for weeks that by the time the court hears this case in the fall, the 90-day clock set by the order itself will have run out. (Due to the court’s decision, the 90-day ban stipulated by the order will begin this week, meaning the clock on the ban is scheduled to run out in late September.) Moreover, the “internal review” ordered for Section 2(c) of the ban will presumably be complete by then. That means the justices will have nothing left to decide when they hear the case in October. Lederman reads Monday’s ruling as an attempt to push off travel ban litigation for long enough that none of it will matter anymore. In the meantime, Lederman speculates, new suits will be filed challenging whatever new regulations the government promulgates. But either way, the bulk of the March version of the president’s travel ban will either be moot or superseded by subsequent directives and appeals. Lederman goes so far as to suggest that come October, the court may not even bother hearing the appeal. The order explicitly asks the parties to brief the question of whether the case is moot once the time limits have run out, indicating that at least some justices are genuinely concerned about mootness. It’s useful to remember the thing we have learned repeatedly in our brief national foray into Trump Law™: Ambiguity and vagueness inevitably help the president and not the people stranded at borders waiting for it all to be worked out at the courts. Each time the rules change, Trump claims a win and travelers are uncertain. The travel ban won on Monday—except for where it lost. Defining the space between those two poles has essentially been left to the Trump administration and the Department of Homeland Security, and after that—one imagines—to the courts. This isn’t so much a win or a loss as an interregnum. We will have to spend the summer watching the next moves from both sides. We know that three justices think Trump wins this thing. It’s anyone’s bet as to whether the other six think he loses or just want it all to go away.